I spent the day shooting at The NFL Rookie Premiere. The day is set up so trading card companies can build a library of images for card sets prior to the next NFL season. I was one of 6 photographers shooting, each photographer has a completely different set-up so the client ends up with a variety of looks. Chris Covatta had the set next to me that included a snow machine for a winter scene. His snow kept drifting onto my set, nothing like a little winter in Southern California. Over the course of the day we photographed 30+ rookies. The day is challenging since you have limited time with each player and need to get a variety of looks. 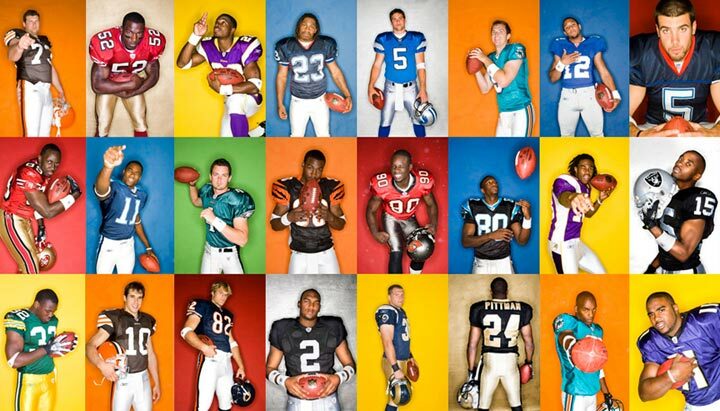 I worked with three simple lighting set-ups and a variety of colored backgrounds that we had painted for a shoot at the NFL Pro Bowl a few years back. Since the players are running from set to set, they get a bit tired of the whole thing by the end of the day. I would show them several images so they would get a feel for the shots and see that they were looking good. Once they got a feel for what I was after, they seemed to get into a bit more and be more animated.